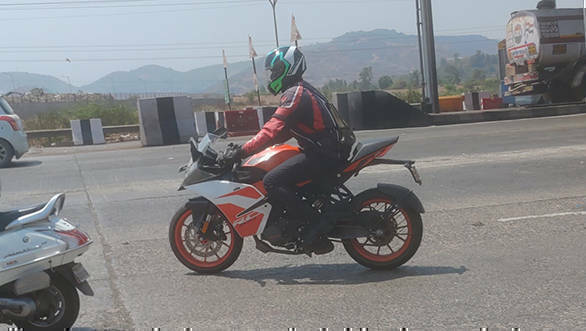 While we Indians wait for an official announcement regarding the KTM 390 Adventure and the KTM 790 Duke, a test mule of the KTM RC 125 was spotted on the outskirts of Pune, India. KTM seems to be preparing a Yamaha YZF-R15 V3 rival and we expect the bike to be launched in the upcoming festive season. Adding to this belief is KTM's act to pull down the RC 200 from their official KTM India website. As the KTM family tradition, the RC 125 will be a faired version of the KTM 125 Duke, however, with substantial changes. The changes include a committed rider's triangle, with clip-on handlebars. The body panels are expected to be designed as seen on the KTM RC 390 and the 125cc supersport will have rear, higher set footpegs. The bike is expected to carry the same cycle parts as the 125 Duke which include WP upside down suspension in the front and a 10-step preload adjustable mono-shock absorber in the rear. The KTM RC 125 will be equipped with a single-channel ABS (Anti-lock braking system) with a rear wheel lift sensor. 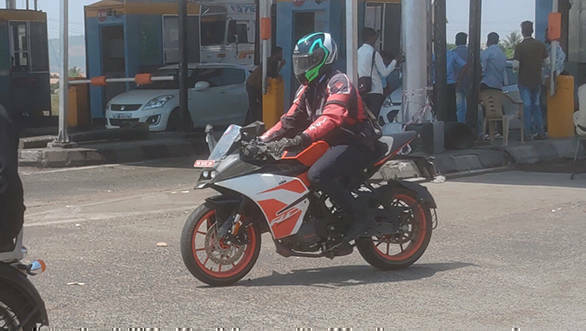 Earlier this week, KTM hiked the price of the KTM 125 Duke and the bike now retails at Rs 1.25 lakh ex-showroom India. The KTM RC 125 could be priced close to the Rs 1.35 lakh mark ex-showroom.